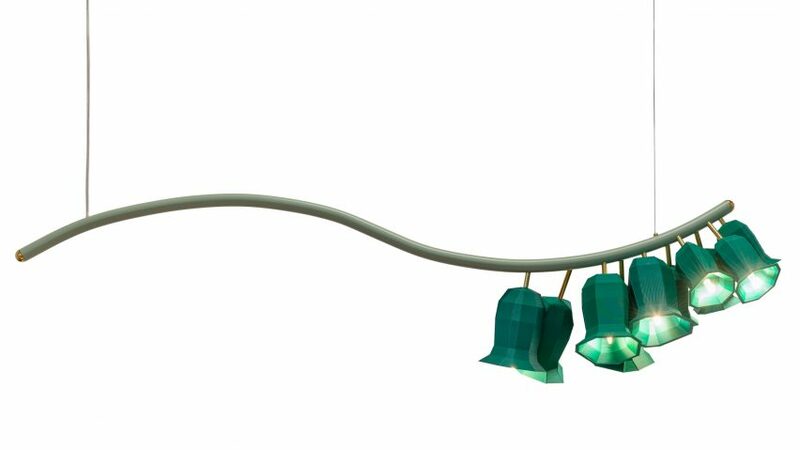 Kiki van Eijk has created a collection of lights based on foxglove plants in her garden, which she presented during this year's Dutch Design Week. The Dutch designer began her Plant Lamps project soon after the birth of her son, when her partner – and fellow designer – Joost van Bleiswijk purchased a 3D-printer. Van Eijk began experimenting with the printer, aiming to recreate the forms of her own foxglove plants. This resulted in a series of bell-shaped lamp shades that she has used to house LED light bulbs. "I spend a lot of time in my garden and outdoors in general," the designer told Dezeen. "But what caught my attention this spring was the digitalis – or foxgloves." "When it gets its full bloom, [the plant] starts to get top-heavy and then it starts to bend down in all sorts of funny curves." To replicate these "funny curves", Van Eijk hand-bent metal tubes for the flower-shaped shades to attach to. For floor-standing models, she also designed a cast-concrete base that she pigments in the same colour as the rest of the fixture. Each of the shades is 3D-printed from bioplastic, with the extrusion marks purposefully left in place. "I love that imperfection that arises when plants get to the end of their bloom," she said. "I had the idea to 3D-print the light shades in bioplastic in very low resolution, so you'd see the structure of the printing technique and give the material more soul." "Here you see how low tech and high tech can form a perfect match!" The Plant Lamps collection formed part of Van Eijk and Van Bleiswijk's Tinkering Labs exhibition at Dutch Design Week, which was hosted at their new studio, in a building that was once a laboratory for electronics brand Philips. The exhibition offered visitors a first-hand insight into how the designers work on a day to day basis. Collections were presented alongside the machines used to make them, as well as sketches and scaled-down models. Here, Van Bleiswijk also presented a new furniture and lighting collection that is designed to look like his paintings. Also during the festival, Dezeen hosted a series of talks discussing how design can answer some of the world's big problems, from pollution to terrorism. All of these talks are available to watch via our Good Design for a Bad World page.